The pre-meeting open mike Question and Answer period began at 4:21 p.m. Since there have been vacancies on the Executive Board, there was a question about the duties of functional vice-presidents on the E-Board. Pres. Jesse Sharkey responded that Elementary Functional vice-presidents are the largest bloc on the E-Board and their role is to represent the interests of the elementary teachers. Delegate Theresa Boyle asked who decides how much money from the Political Action Fund which, she stated has about $280,000 in it currently, is given to each candidate? Jesse responded by saying that the Fund gets about $750,000 per year (these are voluntary contributions) and the Executive Committee, consisting of the CTU officers and the Chair of the CTU Trustees determines the allocation of funds. A delegate expressed concerns over a new pilot program called Spanish Based Grading. Jesse had only recently heard of this and asked the delegate to forward more information to the Union about it. Bessie Tsitsopoulos, citywide social worker, expressed concerns on how the news media got word of the proposed list of endorsements for the upcoming municipal elections. Jesse doesn’t know and was also concerned about it. The House doesn’t always follow the recommendations of the E-Board (note its refusal to endorse Pritzker in October). Jesse said the endorsements were listed on the CTU members’ portal and someone must have leaked it from that. He stressed that delegates and members need to keep in-house issues in-house! at least until action on them is taken. There were complaints about the weaknesses in the current contract that mandates a reduction in paperwork; that the current language is too vague to enforce. Jesse recognized this and said that the wording needs to be tightened up. 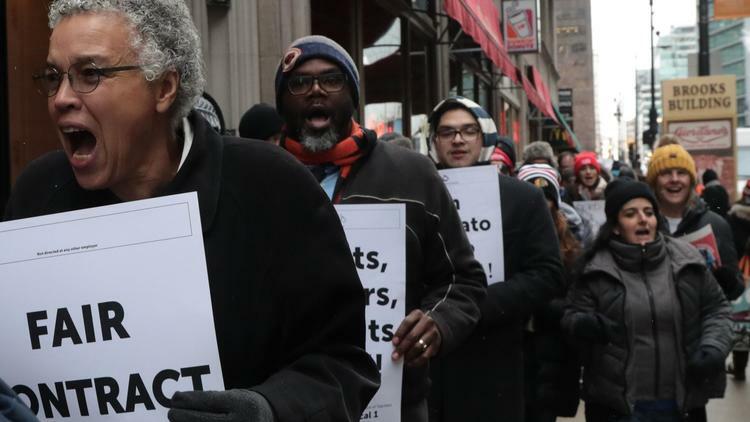 With contract negotiations coming up, he said that we submitted about 340 proposals in the last contract negotiations but this time the CTU hopes to prioritize just 75 issues to make a better contract; not a longer one. There were more complaints about teachers not receiving approval for re-imbursement of expenditures for things for the classroom. Previously, principals could okay the requests but that was taken away from them and now CPS bureaucrats are in charge and often don’t understand exactly what teachers need in the classrooms. Anyone who was refused a re-imbursement should file a grievance. We tend to win on this issue. A delegate was very concerned about CTU field reps not returning calls. Despite a CTU policy of returning calls within 24 hours, some delegates claim it takes 8-10 days to hear back! Jesse asked for information and he will look into it. The actual meeting then began about 4:50 p.m..
Michael Brunson – Recording Secretary. Michael urged delegates to file class size complaints on the special form. The contract has a specific clause on this and not all the money allocate to ease class size has been used yet. Michael yielded the microphone to Martha Baumgarten, vice chair for elementary teachers in the striking Acero teachers. She said that there seems to be some movement by the Acero directors as the strike is entering its third day. Some of the media has mentioned that the head of Acero, Richard Rodriquez, has not yet been involved in negotiations and the media has picked up that he gets paid more than CPS head Janis Jackson although she runs about 550 schools and he is in charge of only 15. Bargaining will continue and CTU members who can are asked to join their picket lines. Kathy Catalano – Financial Report. Kathy gave a three month summary of our finances from July 1 through October 31. Her report showed a deficit for that time period of $3,438,593. She also pointed out that the CTU received no dues during July and August so things are not as dire as they appear. Maria Moreno – Financial Secretary. Maria conducted elections in the House to fill functional vice-president and high school vacancies on the E-Board. Arathi Jayaram was chosen by elementary delegates to serve on behalf of the elementary teachers and Jackson Potter was chosen for the high school teachers. Stacy stressed the number of hours that various CTU members put in to come up with the political endorsements. I felt she was implying that opposing them would be an insult to those individuals. She said when she first hired on with the CTU in 2011 as apolitical director, she often felt ignored and dismissed by the political powers that be. Things are different now. We are in a position of power as we have a CTU member who is an alderman running for re-election, a member now on the Cook County Board, and one elected to the General Assembly. She hopes that we will also have three more CTU members elected to the City Council in 2019. At an October House of Delegates meeting some delegates objected to plans of the Union to get political endorsements for the November election approved. Jesse said that it was important to do that then as on election day potential CTU candidates for City up-coming elections could stand outside polling places to gather signatures need for ballot access. Jesse also recognized the intent of the CPS to increase co-pays and other health insurance costs. As reported earlier, the CPS has not met with the CTU to try to find ways to reduce overall costs so the CTU is filing a grievance on this. Jesse acknowledged there are many problems with ASPEN, a new CPS plan on recording student grades and attendance. He will be in contact with the CPS over this issue. Jesse reported that a soon to be fired private contractor stole a computer with data on 80,000 CPS employees. He was arrested a day or two later and the Police are conducting a forensic investigation to determine if the data was copied. He asked the CPS to pay for credit monitoring of all individuals who may have been affected but has not yet received a response. The president also referenced the 20 schools that had no heat on the Monday after Thanksgiving. He opined that the CPS decision to privatize engineers may have contributed to the debacle. Jesse again mentioned the problem of getting sub coverage for absent teachers. With teachers only able to bank 40 days total, they are using them to avoid losing them. He hopes that the Board comes to its senses and increases the bankable days in the next contract. Jesse ended his remarks by lauding the striking Acero workers and also stressed that with contract talks approaching that no one leak any information about our demands and any progress in negotiations for the a contract. Municipal endorsements. The big discussion was about the endorsement formayor. Almost everyone who got to the microphones spoke in favor of the recommendation to endorse Toni Preckwinkle for mayor. Only one delegate, Autumn Laidler from national Teachers Academy, spoke in favor of another candidate, Amara Enyia. After debate was closed, a voice vote was taken and only 2-3 delegates voiced “nay”. Preckwinkle won overwhelmingly. Although I personally favor another candidate, I voted for Preckwinkle as over half of you who responded to my request indicated that you prefer her. I also found it interesting that almost all of her supporters at the microphones included concerns in their remarks; saying that they she is not the perfect candidate and so on. The rest of the candidate endorsement recommendations were approved. Four of them are CTU members, including Sue Sadlowski Garza seeking re-election (10th Ward), Tara Stamps (37th Ward), Diane Daleiden (40th Ward), and Erika Wozniak (46th Ward). The election is in late February and I am sure the CTU will be sending out information to you on all the endorsed candidates by then. Two resolutions passed unanimously. They are: Resolution to Oppose the Efforts by the United States Department of Health and Human services to ErasenPeople Who Are Transgender and Intersex from Federal Law and Tri-National Resolution (This deals with co-operation between teachers in Canada, Mexico and the U.S.). Chris Bachrend – Organizing. Chris asked that those of us who can join the picket lines of the striking Acero teachers tomorrow and every day, if possible. There are 15 locations scattered around the City and there may be one close to you. Jennifer Johnson/Jackson Potter – City-Wide PPC. Jen reported that over 400 suggested contract demands where submitted but that 75 of them will be given which happened last contract time. Mary Sharon Reilly – Pension. Mary Sharon reported the results of the recent election for CTPF elections and pointed out that 33% of retirees voted but only 22% of active teachers did so. Kellie Petty of Ruggles School objected to the House spending so much time on politics when there are so many problems in the classroom. The response from Vice President Davis Gates was that politics impacts the classroom a lot and we need to use our political influence to get better funding and other legislation that will make classroom conditions better. Jim Vail of Hammond said that the CTU had previously passed a resolution to get rid of Columbus Day and replace it with Indigenous Peoples Day. Students at his school were circulating petitions to go to the CPS to effect that change and offered copies to any delegates who wanted them for their schools. Stacy suggested that he submit them to the CTU (Human Rights?) committee so that, once approved, it can be distributed to all schools through the CTU. Bessie Tsitsopoulos, citywide social worker, expressed concern that not every school has a delegate. The CTU is well aware of this and has been trying to be in contact with those schools to find individuals who would be willing to take on the delegate’s job. Retiree delegate Helen Ramirez-Odell objected to the CPS plan to increase the number of “temporary’ nurses in the schools. She said there are only about 100 certified nurses right now and to have temps who often walk away from the job does a great disservice to the students who need full-timed dedicated nurses. The meeting adjourned at 7:12 p.m.
the comment from that Delegate was about Standards Based Grading -- it's the grading system we now use at Lindblom. With a standing vote, Preckwinkle's endorsement passed with ~200 in favor and around ~80 against. Decisive, yes. The vote to endorse the other candidates passed with only a small number of no votes. Preckwinkle didn’t stand with NTA until the court verdict came down. She stands for Elected School Board, but so’s Amara Enyia, who’s for taking the machine out of Chicago, and other things we’ve been fighting for." Thank you George for your notes about the meeting, because I sit in the visitors sections and delegates who are suppose to sit in there section, sit in the visitors section and conduct their business, I did not hear the name or school when two teachers who were at the mic asked Jessie why when they tried to contact the Grievance Department, received the run around and no one called them back for 11 DAYS, Then Jessie turned it over to Sara Eehevarria and her response was more defensive than assisting with these teachers that had situation at their school and called the CTU for assistance, why didn't you write about that?